Sight-threatening retinopathy is a serious complication of diabetes and is largely preventable through regular retinal screening and prompt treatment. Retinal screening should be carried out at least every two years, but more frequently for those who have risk factors such as a longer duration of diabetes and existing retinopathy. Retinal screening should be carried out at least every two years. More frequent screening regimens are indicated by clinical risk factors such as the duration of diabetes and the degree of pre-existing retinopathy. Approximately 5 – 7% of New Zealand adults have been diagnosed with type 1 or type 2 diabetes.1 The actual number of people with diabetes is likely to be much higher than this. The self-reported prevalence of diabetes is two to three times higher among Pacific, Māori and Indo-Asian people.1 Diabetes is a leading cause of blindness, end stage kidney failure and complications leading to lower limb amputation. It is a major risk factor for cardiovascular disease and early mortality. Regular health checks are essential to reduce the frequency of complications from diabetes, as well as to minimise their impact. The “Get Checked” programme is a national initiative, offering free annual health reviews to people with diabetes, by their GP or practice nurse. The programme aims to promote early detection and intervention for problems associated with diabetes. The PPP goal is for at least 80% of all people with diabetes enrolled in a practice to have had a full annual “Get Checked” review each year. The annual check for people with diabetes is also a PHO Performance Programme (PPP) indicator. In 2009 53% of the estimated number of people with diabetes in New Zealand had an annual “Get Checked” review.2 This is an improvement from the previous year (46%),2 but this number still falls considerably short of the PPP target of greater than 80%. There is much variation throughout DHB regions and PHOs, with some areas achieving better results. Technical difficulties in data collection may contribute to lower figures in some areas. Consider the barriers to achieving this goal and ways in which the practice can address this. People with diabetes who are not receiving an annual free review, are potentially at a greater risk of developing harm from complications, which could have been treated if detected early enough. Diabetic retinopathy has been, until recently, the leading cause of preventable adult blindness and vision impairment in New Zealand. Factors such as advances in treating retinal damage and more effective screening are slowly decreasing the prevalence of diabetic retinopathy in some areas. 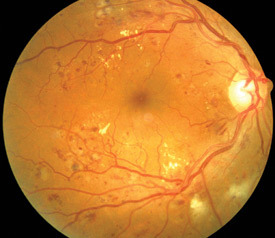 Sight-threatening diabetic retinopathy is largely preventable, through regular retinal screening and prompt treatment. Primary care plays a critical role in ensuring that patients are referred for and attend retinal screening so they can be treated before avoidable loss of vision occurs. Diabetic retinopathy is asymptomatic until it is at an advanced stage and then it is usually too late for effective treatment. Therefore early detection and prevention are imperative. N.B. : People with pre-diabetes (impaired glucose tolerance and impaired fasting glucose) do not require retinal screening and should not be referred. Each DHB has an individual arrangement with local providers for retinal screening (contact your local DHB if you are unfamiliar with referral options). Screening is usually performed by a suitably trained optometrist, photographic technician, ophthalmologist or other clinician. A designated ophthalmologist usually oversees each local retinal screening programme, to ensure consistency in grading of retinopathy. Early retinopathy is asymptomatic. Signs of blurred or fluctuating vision, spots or “floaters”, if related to diabetic retinopathy, are most often associated with advanced disease. People with diabetes who present with an acute impairment of vision from any cause should be referred for urgent review with an ophthalmologist/eye clinic. Best practice tip: Retinal photo-screening for diabetic retinopathy does not constitute a full eye examination. Patients should still be regularly reviewed for other eye pathologies such as cataracts or glaucoma. Primary care clinicians can test visual acuity using an eye chart and pinhole. As a general rule, if visual acuity improves with pinhole testing, then it is more likely that any reduction in visual acuity is due to a refractive error (and may require subsequent referral to an optometrist) rather than due to pathology in the eye (which would require referral to an ophthalmologist). In some circumstances, risk factors may be present indicating that earlier re-screening or referral to an ophthalmologist should be considered. Diabetic retinopathy can progress rapidly during pregnancy. Women with diabetes who become pregnant should be screened in the first trimester of their pregnancy. If no retinopathy is detected and the diabetes is well controlled the two-yearly screening schedule may be continued. If a minimal degree of retinopathy is detected or if the diabetes is not well controlled, three-monthly screening for the remainder of the pregnancy is recommended. Referral to an ophthalmologist is required if more than minimal retinopathy is detected.3 N.B. Women who develop gestational diabetes during pregnancy are not generally at increased risk of retinopathy unless they have pre-existing disease. Conventional retinal examination involves using an ophthalmoscope to view the fundus through a dilated pupil, in a darkened room. However it is difficult for even the most experienced examiners to achieve high sensitivity of retinopathy detection with this method. 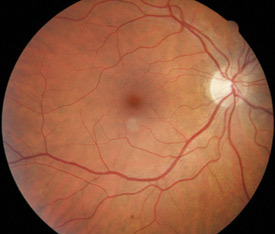 Macular oedema is also not generally able to be detected with an ophthalmoscope. After screening, the examiner grades the degree of retinopathy in each eye and applies an overall grading, depending on the worst affected eye. It is important that the examiner follows standardised New Zealand screening protocols for grading.3 The grade of retinopathy determines what follow-up action is taken. Fluorescein angiography can be used to detect macular oedema if this is suspected. This involves dye being injected into the arm and img taken as the dye progresses through the blood vessels in the retina. Retinal examination usually involves pupil dilation using tropicamide 1% eye drops. This is safe for most people with diabetes, including those being treated for chronic open angle glaucoma (but not closed angle glaucoma). The duration of diabetes is the most significant risk factor for diabetic retinopathy.3,6,9 Poor glycaemic control is also a major contributor to both the risk of development and progression of diabetic retinopathy.3 Other modifiable risk factors include hypertension and nephropathy.3 Elevated blood lipid levels have a weaker association with diabetic retinopathy but contribute to overall cardiovascular risk in a patient with diabetes. If a person with diabetes is found to have signs of mild retinopathy, managing risk factors can help prevent more advanced changes from developing. Intensive glycaemic control appears to reduce the risk of most complications of diabetes, including retinopathy but it has to be balanced against the increase in risks, such as severe hypoglycaemia, and some concerns about increased risk of mortality. See article “HbA1c targets in people with type 2 diabetes – do they matter” for more information about intensive glycaemic control, including discussion of risk factors and adverse effects. Many patients with diabetes and a high cardiovascular risk will be taking aspirin. If the patient also has retinopathy, should aspirin be continued? Management of hypertension is essential for people with diabetes, however there is conflicting evidence as to whether intensive control is beneficial for reducing progression of diabetic retinopathy, and what blood pressure level is required. The UK Prospective Diabetes Study (UKPDS) found a 34% reduction in the risk of progression of retinopathy after nine years in patients with tight control of blood pressure (target < 150/85 mmHg, using captopril or atenolol).14 However, the later ACCORD study found no significant benefit for diabetic retinopathy progression in those on intensive hypertensive control (< 120 mmHg, 10.4%) compared with standard treatment (<140 mmHg, 8.8%), nor a benefit in cardiovascular outcomes.12 The differing parameters for intensive blood pressure control and time frames of these studies may have contributed to the different conclusions. Optimal lipid levels are advised in people with diabetes for cardiovascular risk reduction, but the beneficial effect of intensive lipid control on diabetic retinopathy is less clear, and there is little or no evidence that statins have any benefit for retinopathy. Fenofibrate is not currently registered in New Zealand or funded on the pharmaceutical schedule. It is in the fibric acid derivative class of drugs which also includes bezafibrate (registered and funded) and gemfibrozil (registered). Statins remain the primary agent for lipid control in people with type 2 diabetes. 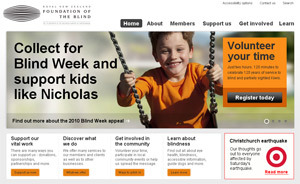 Community organisations and agencies such as the Royal New Zealand Foundation of the Blind offer information about low vision counselling, training, and other special services for people with vision impairments. There is a strong association between diabetic retinopathy and other microvascular complications such as nephropathy and neuropathy, and all are associated with a higher cardiovascular risk. Managing risk factors for retinopathy will generally also decrease the risk of these other complications of diabetes. A person with coexisting retinopathy, renal and foot disease is at a high cardiovascular risk as well as high risk for requiring amputation. What causes diabetic retinopathy and how does it manifest? The microvascular changes that occur throughout the body as a result of diabetes, also affect the eye. Microvascular changes within the retina are the most likely to adversely affect vision. Microaneurysms – small swellings that form on small retinal blood vessels; if the swellings leak or burst, plasma or blood can leak into the adjacent tissue. Early to moderate stages of diabetic retinopathy are usually without any noticeable symptoms. Symptoms may be experienced in proliferative retinopathy, particularly with haemorrhage and retinal detachment. NB: Sudden onset of visual symptoms or deterioration requires referral for specialist assessment, rather than for routine screening for retinopathy. Laser photocoagulation is the primary treatment for sight-threatening diabetic retinopathy, however it is not always completely successful in restoring visual loss. Better results are achieved if treatment is carried out earlier in the disease process.18 For the majority of cases the goal of treatment with laser photocoagulation is to reduce the rate of visual loss or to stabilise visual acuity. During laser photocoagulation, a laser is applied to the retina, causing burns. Different methods of laser surgery (or combinations of methods) are carried out depending on the pathology being treated. Surgery is usually completed in one session, but if both eyes require treatment, this normally occurs several weeks apart. Vitreous surgery may be required in patients with some types of retinal detachment, vitreous haemorrhages and severe proliferative retinopathy. Vitreous surgery has the potential for serious complications including significant visual loss and eye pain. A vitrectomy is performed under local or general anaesthesia. A tiny incision is made in the eye and the vitreous gel clouded by blood is replaced by a saline solution. After the procedure the eye may be red and sensitive, an eye patch may be required for a few days or weeks to protect the vision, and antibiotic eye drops may be required to reduce the risk of infection. Thank you to Dr Paul Drury, Clinical Director, Auckland Diabetes Centre and Associate Professor Gordon Sanderson, Ophthalmology, Dunedin School of Medicine, University of Otago for expert guidance in developing this article. Ministry of Health (MoH). A portrait of health: key results of the 2006/2007 New Zealand Health Survey. Wellington: MoH, 2008. Available from: www.moh.govt.nz (Accessed August, 2010). District Health Boards New Zealand (DHBNZ). Reporting back to the public - DHB Performance results June 2009. Wellington: DHBNZ, 2010. Available from: www.dhbnz.org.nz (Accessed August, 2010). Ministry of Health (MoH). National diabetes retinal screening grading system and referral guidelines 2006. Wellington: MoH, 2008. Available from: www.moh.govt.nz (Accessed August, 2010). Frederikson L, Jacobs R. Diabetes eye screening in the Wellington region of New Zealand: characteristics of the enrolled population (2002 - 2005). N Z Med J 2008;121(1270). Simmons D, Clover G, Hope C. Ethnic differences in diabetic retinopathy. Diabet Med 2007;24(10):1093-8. Younis N, Broadbent D, Vora J, Harding S. Incidence of sight-threatening retinopathy in patients with type 2 diabetes in the Liverpool Diabetic Eye Study: a cohort study. Lancet 2003;361:195-200. Hutchins E, Sanderson G, Rahman A, et al. Factors affecting effective implementation of the National Diabetes Retinal Screening grading system and referral guidelines: A multi centre analysis: Unpublished report to the Health Research Council New Zealand (pers comm G. Sanderson). Merck. The Merck manual for healthcare professionals; Angle-closure glaucoma: Merck, 2008. Available from: www.merck.com/mmpe/sec09/ch103/ch103c.html (Accessed July, 2010). Cikamatana L, Mitchell P, Rochtchina E, et al. Five-year incidence and progression of diabetic retinopathy in a defined older population: the Blue Mountains Eye Study. Eye 2007;21(4):465-71. Early Treatment Diabetic Reintopathy Study (ETDRS) Research Group. Effects of aspirin treatment on diabetic retinopathy. ETDRS report number 8. Ophthalmology 1991;98(5 Suppl):757-65. The ACCORD Study Group and ACCORD Eye Study Group. Effects of medical therapies on retinopathy progression in type 2 diabetes. N Engl J Med 2010;363(3):233-44. Spurling G, Askew D, Jackson C. Retinopathy screening recommendations. Aust Fam Physician 2009;38(10):780-3. UK Prospective Diabetes Study Group. Tight blood pressure control and risk of macrovascular and microvascular complications in type 2 diabetes: UKPDS 38. BMJ 1998;317(7160):703-13. Keech A, Mitchell P, Summanen P, et al. Effect of fenofibrate on the need for laser treatment for diabetic retinopathy (FIELD study): a randomised controlled trial. Lancet 2007;370(9600):1687-97. Walsh C, Soler N, Fitzgerald M, Malins J. Association of foot lesions with retinopathy in patients with newly diagnosed diabetes. Lancet 1975;1(7912):878-80. Liew G, Klein R, Wong T. The role of genetics in susceptibility to diabetic retinopathy. Int Ophthalmol Clin 2009;49(2):35-52. Simo R, Hernandez C. Advances in the medical treatment of diabetic retinopathy. Diabet Care 2009;32(8):1556-62. Watkins P. ABC of diabetes: retinopathy. BMJ 2003;326:924-6. Goold L, Durkin S, Crompton J. Sudden loss of vision: history and examination. Austr Fam Phy 2009;38(10):764-8.